That was part of a broader argument against rosy German growth prospects. 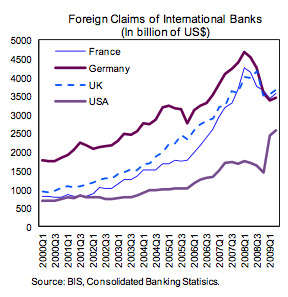 The IMF breaks down the “Geographical distribution of Foreign Claims on International Banks,” for Germany, France, the United Kingdom and the United States. By a wide margin, the United States has the least exposure in Southern Europe, with only $118.5 Billion of its $2.58 Trillion in foreign claims. The U.K. has the second lowest exposure at $236 Billion of its $3.69 Trillion in foreign claims. German bank exposure is $523 Billion of $3.46 Trillion and French exposure is $781 Billion of $3.57 Trillion. Based upon those stats, it looks like the downgrade of French growth should be in process. policies from employment smoothing to fostering domestic growth. self-sustaining by 2011, consolidation should become a priority.